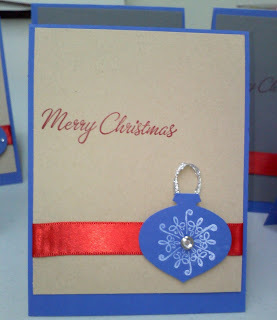 I loved the idea of making simple cards with a splash of glitter, shine- or just a little Pop factor. Here I used some shiny ribbon and rhinstone brad to capture that look. There are two color combinatiosn that I used. Brillant Blue & Kraft or Brillant Blue and Grey. Lighting on the dark evenings I got these created do not show much of the details. The cars above is the grey and the one below is kraft. Red ribbon and dimensionals on the ornament completes the card. 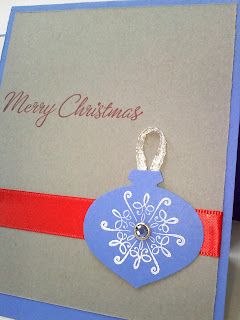 On the inside I used another snowflake from Serene Snowflakes.